Big Finish: Doctor Who - AND YOU WILL OBEY ME Review | Warped Factor - Words in the Key of Geek. This month sees the start of something that promises to be very special indeed – the Two Masters Trilogy. Episode 1 of the trilogy sees the Fifth Doctor flying solo, and slots this adventure firmly and deliciously into established on-screen Who history. It would be fair to say that Alan Barnes’ script is an odd one, pitting Geoffrey Beevers’ Traken Master against the Fifth Doctor in a story with a bunch of 1980s teenagers living in 2016, a gang of intergalactic worthiness-obsessed assassins and a couple of eight feet tall dragonflies. What it does though is show the Master’s indefatigable will to survive in a new way, giving Beevers the chance to really flex his Master muscles. You’re going to want to get this one, because when Beevers really flexes his Master muscles, it’s a thing to revel in. Perhaps the oddest thing in this release is also one of its most enticing. The Master essentially gets a gang, a collection of plucky young things whose eyes he can open to the realities of the universe. This is the Master as Fagin, sending out his young accomplices to rob, coerce and eventually kill for him. He gives them each a little of himself and his power, so the title of this release becomes almost a catchphrase, spoken by characters who never entirely do it justice – and by Beevers himself, who does it so much justice it’ll give you shivers. So is that the point of this release, then? The Master and his gang? In a way, perhaps, but don’t let that fool you into thinking there’s not plenty of action to push the story forward. It all begins with a very particular item coming up for auction, and the Doctor bidding on it. So, it turns out, is Annie, who may or may not be from MI5. The item is the only thing to have survived an appalling house fire which took the life of a reclusive tenant by the name of Martin Masterson. Annnnd cue the nuts-going, given the name. In essence it’s a story of temptation, and promises, and an unlikely Scooby Gang who stumble on something far far beyond their understanding. It’s a story of the various ways they deal with what they find, or indeed fail to deal with it. It’s to some extent a turnabout story of the care that parents take to ensure the best for their children, and the importance of how they define what ‘best’ actually means, in a way mirroring the Doctor’s long history of taking young people under his wing and showing them the universe and his way of looking at it. But with evil Time Lords, giant dragonflies and occasional Russian murder-squads. You’re going to get a thrill out of the Russian murder-squads, not so much from their existence, but from the way they’re described by one character. It’s so cute and shiver-making I really, really want to tell you more about it – but I can’t, because that would spoil the moment when you hear it. There becomes a need, as the story goes on, to grab hold of what certainties you can as they fly past your face, given that fairly big assumptions you’re invited to make early on turn out not to be true in the way you think they probably should be, and you’re faced with questions of what exactly is going on, and what you’ve just assumed is going on. But it all paves the way for the Master’s return to the universe after a personal hiatus of over thirty years. That return touches bases with several other Master stories, including Beevers’ own regeneration into the Ainley Master at the end of The Keeper of Traken, and even to some extent the snake-form’s seeking out and possession of Eric Roberts in the TV movie. This trilogy sets out to put the Master front and centre, and it does it in this release in a number of unusual, slightly obscure ways before coalescing into a festival of sheer Beevers glee. Vocally, some of the characters sound fairly similar, and this is a release that repays a second listening far more than it does the first – once you know what’s happening, and who’s actually what and why, it makes a lot more sense and actually becomes a more universally enjoyable experience. There’s a chance you’ll be clinging on to your understanding for dear life by episode three the first time round, which is mostly the result of people not being who they claim to be, or what they seem to be, and there being a kind of dramatic double-standard at work in order to maintain two streams of the single threat that is the Master. But if Annie and Janine, Mikey and Colin need you to concentrate to separate them in your mind the first time around, the second time you listen to it, the story flows with a greater logic, even if the alien denouement (What? You already knew there were giant dragonflies and mad assassins in it!) is still a little on the shamelessly weird side. Through it all though, our anchor in this story is Geoffrey Beevers. 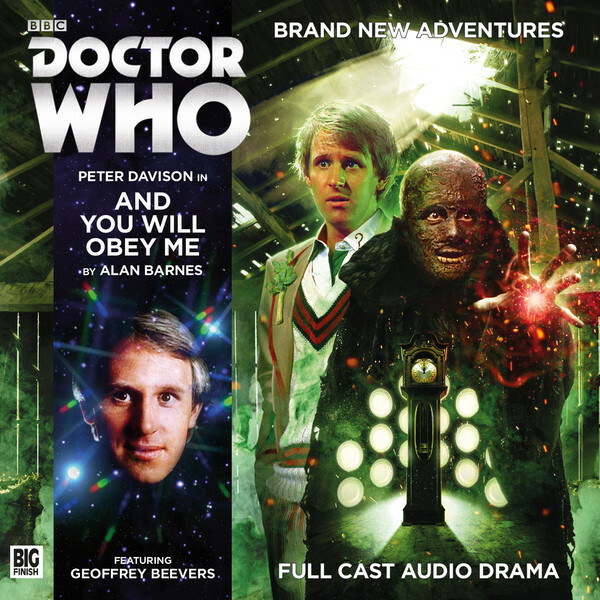 Peter Davison’s perfectly pitched as his younger self, but it’s the range that Beevers brings to the Master, by turns paternalistic, coaxing, almost seductive but also brusque and brutal that really makes you stay with this story and absolutely pays you off at its end. Not for nothing does Beevers, in the extras, claim that this is one of the best Master scripts he’s been involved with – which, coming from the man who embodied the Master in Dust Breeding, in Master, and in Mastermind, is really saying something. Beevers at Big Finish has had the same sort of opportunity as the later, less universally popular Doctors during their on-screen years – to add depth and colour and richness and variety to his portrayal of his signature Time Lord. Here, he finds something new to add again – he’s revelled in the sheer driven evil of the Master before, but there’s something almost playful, something almost kind, something, to be fair, rather more like Geoffrey Beevers himself, about the Master in this release, at least until he has his gang where he wants them, then the steel trap of the Master’s personality slams shut and you realise exactly how dark, how Machievellian and brutal and inherently sinister a character he is. It’s impressive stuff, and even when it all sounds like it’s over, there’s a final ghastly twist – again, bringing The Keeper of Traken back to mind. More than anything else, there’s a sense in this story of exactly what the ending of The Keeper of Traken must have felt like from the Master’s point of view, when he finally acquired a body again that would not infinitely degenerate back to his cowled, burned-looking form. From our strictly linear point of view, we only saw him in his skeletal, burned form twice, and there’s some temporal twisting in the cowled Master’s life, as Dust Breeding seems to explain that he reverted to that ‘fundamental’ form after the Roberts Master, but Beevers has certainly added enough to the cowled Master’s life and career in his time at Big Finish so far to make us appreciate how long he must have suffered in that form before finally finding Tremas and a form he could inhabit on an ongoing basis without suffering that appalling bodily decay. Given the Master’s state and nature in this story – seemingly distributed between a gang of individuals, surviving any way he can – we can view the end of The Keeper of Traken and the subsequent pair of Bidmead snoozefests in a whole new light. One to get then? One not to miss, certainly, as it kicks off the Two Masters trilogy, and there’s even more fun to come, with the Beevers and McQueen Masters featuring over the next two releases. There’s good comedy here (you’ll chuckle over where Tegan is during this adventure – and her reaction to it), along with a pinch of nostalgia we can only imagine was weird for Peter Davison to record. The pacing is punchy at the start, through it grows more circumspect as the story pushes on, and we end up almost with two narratives competing for dominance, the 1984 story and the 2016 story, but for the most part, it’s Beevers as the Master who will give you your value for money in this release. What he gives you though is worth much more than you spend, his own bouncy, warm personality seeming to infuse the Master with a whole new optimistic spirit before the trap is sprung. Look into my eyes. You will go to the Big Finish website and buy this title today, for I am the Reviewer, and you will – oh, forget it. Just go get it and strap in for four hours – two listens, remember? – of pristine Beevers Mastery.